Are you looking for the highest quality 3D data translation to ensure you provide the best geometry for downstream applications? 3D InterOp is the industry-leading 3D CAD data translation software development toolkit. It enables your customers to work with imported 3D data as easily as if it was created natively in your own application, as well as export the 3D data for downstream engineering applications. 3D InterOp’s architecture enables users to optimize the interaction with their 3D data. 3D InterOp supports all major 3D data exchange formats that are required in leading engineering applications and supports 3D CAD / CAM data exchange for any modeler including 3D ACIS Modeler, CGM Core Modeler, and Parasolid. 3D CAD data is commonly used as the primary 3D data source for manufacturing, allowing Model Based Engineering (MBE) to become a reality for many different types of businesses. Sharing 3D data between different silos of the organization is a vital part of the process, requiring uninhibited access to the 3D data, regardless of which application it was generated in. 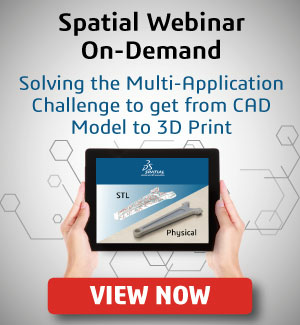 At Spatial, we understand the importance of high quality 3D CAD data translation, in terms of both the quality of the geometry and the associated 3D data that is needed for implementing product manufacturing processes. 3D InterOp provides access to the geometrical models inside CAD files, as well as the manufacturing and process data associated with the models. 3D InterOp is the only 3D CAD file translation SDK that uses libraries supplied by Dassault Systèmes to read and write CATIA data. The input data is always read completely and the version support is always up to date with Dassault Systèmes’ releases. For applications creating new models, 3D InterOp provides export functionality with writers to industry standards such as STL files as well as proprietary CAD formats. In the case of applications working with engineering documents, 3D InterOp allows you to import geometric models from a wide range of industry standards and CAD formats. Not only will the 3D data be read and displayed directly on your screen, but the high quality image will be robust for modeling operations and queries due to automatic healing of both geometry and topology. 3D InterOp also provides manufacturing information from the source system. Translation of the definition 3D data for dimensions and geometric tolerances allows for accurate inputs to manufacturing analysis and processing without the worry of human error, while the translation of the visualization for annotations allows users to see the information exactly as it was displayed in the source system. 3D data interoperability is about much more than just 3D data translation. Problems associated with the exchange of 3D data may not become apparent until later in the workflow when investigation and correction of problems are much more difficult, more costly, and require more investigation. Having a high-quality CAD file import reduces these costly problems. 3D InterOp is fully integrated with multiple modeling kernels, including the 3D ACIS Modeler, the CGM Core Modeler, Parasolid®, and other modeling engines. 3D InterOp solves the inherent problems associated with CAD 3D data exchange throughout the product design and engineering process. By providing the highest quality of 3D data reuse with the ability to selectively import product data, including structure, graphics data, geometry, and manufacturing information from a variety of leading CAD file formats and neutral formats, 3D InterOp offers a means to true competitive differentiation, faster time-to-revenue, and greater quality in your application. What Can 3D InterOp Offer You? 3D InterOp goes beyond “import with no errors” by delivering 3D data that preserves the original design intent throughout the process. 3D data reuse is about ensuring consistency in your 3D import, preserving design intent. Spatial continues to focus on leveraging multiprocessing/multithreading, direct translation, and improved algorithms to provide faster and better 3D data access. We also update our kernel on a yearly basis with powerful new features to help ensure that 3D InterOp remains a powerful solution. Through its architecture, 3D InterOp lets users optimize the interaction with their 3D data. With functionality to provide selective import based on your application need, 3D InterOp enables your application to focus only on the necessary 3D data for a given task. Spatial’s 3D InterOp is a powerful tool that makes your life easier by maintaining design intent throughout the process. The comprehensive suite of features gives your engineers the power they need to create the best solutions. Contact us to get started with 3D InterOp today.